You yourself are NOT allowed to complete the second part of the form. It asks many questions, which ask a variety of these health care professionals questions which I personally believe to be rather unfair. Why? These questions essentially ask the healthcare professionals to gaze in to a crystal ball and predict the future of the accident victim’s health. How can you predict future health? I don’t know. How can a doctor predict somebody’s future health for a patient they barely know, and just met? In many of these cases, busy hospital doctors who work in the ER or OR complete these forms. These doctors see thousands of patients per year. They won’t even recall their names or what they look like. In some cases, they can’t even speak to the patients because they’re unconscious. But, they’re still asked to complete these forms, which I’ve seen done rather poorly to the detriment of the accident victim. Let’s examine some of the questions asked on the OCF-3 Disability Certificate shall we? Both of these questions predispose that the doctor completing the form knows about the accident victim’s pre-accident job. In many cases, the doctor has never met the person before, and has very limited knowledge about what they do or don’t do for a living. That’s why it’s important to get somebody to complete the form who knows about your health history. This question is so vague, that the form actually has to elaborate on the question with an “ie”. This is CLASSIC INSURANCE LAW. In order to answer this question properly, the health care professional completing this form (often a busy doctor), has to sit down with the accident victim and identify what their normal activities of normal life were BEFORE the car accident. Everyone’s definition of “normal life” is different. Some people are human dynamos and have all of the energy in the world. Others are lethargic. It all depends on the person. Not an easy question to answer. One which takes some thought and knowledge of the person. This is one of my personal favourite questions because it asks the health care professional to essentially GUESS at when the accident victim will recover from their injuries. There are date ranges in this question, but it’s a loaded question to begin with. Insurance companies like to hold accident victims to these initial answers if they’re in their favour. It’s always possible for accident victims to supply updated disability certificates to their insurer. This provides the insurer with a better picture of the claimant’s injuries and recovery. The insurer will PAY for having these OCF-3’s updated; but generally only when the insurer requests for an updated one. Providing one every week/month likely won’t be covered by any insurer. If the OCF-3 Disability Certificate is not submitted to the insurer, no monetary benefits will flow to the injured party. Example: let’s say you’re in a coma in the hospital as a result of a catastrophic car accident and that you can no longer work. You would be entitled to an income replacement benefit of $400/week. If the Disability Certificate is not completed and submitted to the insurer, they’re under no obligation to pay out that income replacement benefit. So, if the doctors in the hospital don’t get to it, or don’t complete it properly, then you may have a problem recovering the benefits which you deserve in a timely manner. Believe it or not, things like that happen and they happen to all too frequently. Finally; I’d like to discuss the economics of completing these Disability Certificates. As you can see from above, it takes time to complete the OCF-3 Disability Certificate properly. It takes thought, and knowledge of the patient along with their pre and post accident medical condition. Doctors bill through the OHIP System. They’re efficient at doing so. Time spent reading these forms, and completing them properly is time away from the bread and butter of their busy practices (or time away from helping other in need in a hospital setting). While doctors can certainly send the insurer a bill for completing the form, billing the insurer is more a hassle because it’s NOT THE NORM for said doctors. This is why getting a doctor to complete, or to take their time in completing the OCF-3 Disability Certificate can be problematic. Not impossible. Just slightly problematic depending on the doctor. What happens when you don’t have a family doctor, a physiotherapist, an occupational therapist, a nurse practitioner, or a chiropractor to complete the form? Give us a call and we can help you out with that one. We will be able to put you in touch with a healthcare professional in your area to help you in this regard. Enough law talk? Sure. 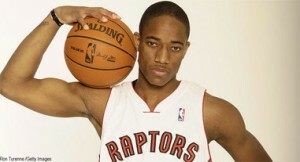 Toronto’s basketball team is sorely missing it’s All-Star two guard Demar DeRozan. He was missed last night in the 4th quarter vs. King James and his cronies. I’m looking forward to his return so we can go on with our winning ways. Still, credit to Toronto. They fought hard and have been making it tough for their opposition despite playing without their All Star guard. And yes: we have re-designed the Goldfinger Injury Lawyers website. This version is seen better on mobile devices and tablets. Let us know what you think by sending an email to info@goldfingerlaw.com We’d love to hear your thoughts!